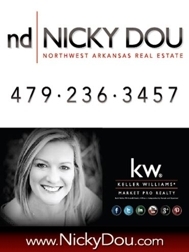 Looking for Homes in NWA? You have come to the right place! Start and finish your Home Search for all of Northwest Arkansas Real Estate right here... From bank owned properties for sale throughout NWA to Luxury homes in gated communities and everything in between - this blog post has all you are looking for! Thanks for dropping in & HAPPY HOUSE HUNTING! If you would rather I look for you - feel free to drop me an email, text or call me at 479-236-3457. Schools are usually one of the most important things to my buyers - below are websites for the main school districts in Northwest Arkansas and below the links feel free to click on the TOP RATED School Reports link to compare all schools. Home for sale in Springdale near Har-Ber Meadows | 289 Ketch Ct.